I was talking to Sheila recently and her hunt for a new winter coat and it got me thinking about whether I could indulge in a new coat myself, so I went online to see what was out there. Both of us agree that having at least a couple coats to rotate throughout the winter is a good idea as it keeps your coats lasting longer. Right now, I have a sweater coat, a Zara utility jacket and 2 leather jackets to get me through the fall, but once the thermostat drops to less than 10 degrees, then it's time to pull out the winter coats. 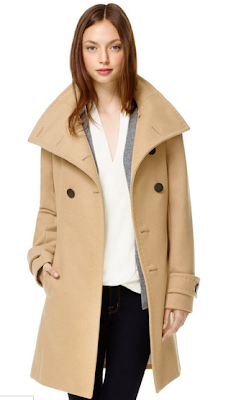 I currently own 2 winter coats: an emerald green Zara duffle coat and a T. Babaton camel coat. I usually reserve my T. Babaton coat for nicer occasions so that I can keep its smooth wool pristine, so most days I end up wearing my Zara duffle. As a result of wearing it almost everyday last year, the wool has begun to pill quite a bit, so now I'm considering whether to buy another everyday coat to replace the old parka I have from high school (yes, my things last that long!). My first pick was this parka with faux leather sleeves. I love the mix of tough leather with the utilitarian cut of this jacket; it just gives off such a downtown feel to this piece. The quilted pattern of the faux leather also gives a cozy visual effect that offsets the gold hardware. Anything leather is super trendy right now and this jacket would be really fun to mix up in different ways, like say with a sweater dress. Again on the casual side of things, is this Zara quilted coat. This coat comes in dark olive and black, but in my opinion, the coat only really works in olive. In black, this coat looks boring and ordinary, but in green, the quilted stitching really stands out. There's nothing too fancy about this coat, but that doesn't mean it's not a worthy purchase. This coat would go well with any outfit and the hood offers shelter from the wind and rain - always an advantage in rainy Vancouver. Now, onto the more fancy coats! My last Zara find (I swear) is this stunning long, red coat. I've always had a fantasy of owning a bright red coat, so of course I instantly fell in love with this cherry red number. The color is really the star of the show with this coat and the design wisely is kept very minimalist so as not to compete. A simple zipper, some gathering at the shoulders and discreet pockets are about the only adornments. Too bad this coat is not made of wool, but rather is a mix of polyester, viscose and cotton, making it probably more appropriate for fall than winter. If you want real warmth though, without sacrificing yourself to a down parka, then you'll have to branch into a higher price bracket to buy wool. I love wool coats and when choosing my wool coats I will obsess over details like button holes and collar sizes to choose the right one. 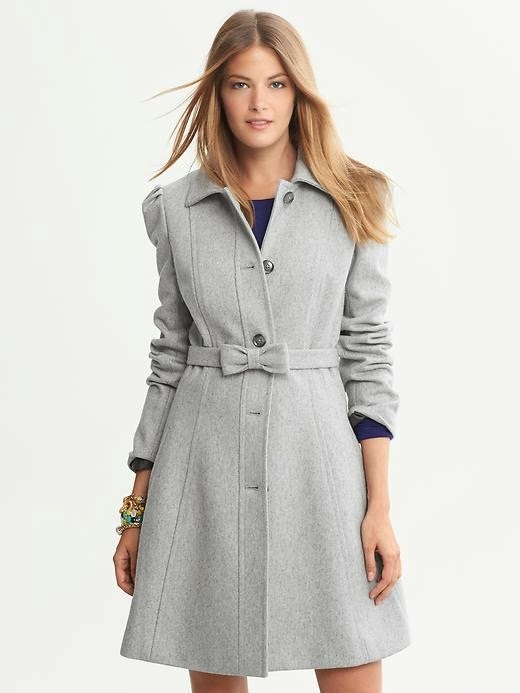 I've never bought a coat from Banana Republic, but this heather gray coat looks just too darling to pass up. Made of 60% wool, this coat is full of feminine details, from its slightly puffy sleeves, to the flared A-line hem and its cute bow belt. If cutesy isn't your style though, then check out my last pick, this classic wool military coat from Aritzia. Double breasted, with a matching belt and high collar, you cannot get more a more quintessential wool coat. The only thing I'm not a fan of with this one is its plain metallic buttons; I feel Aritzia missed a chance to really make this coat pop with some cool, crested buttons, but then if they did, they would probably up the price another $20 per button! I love coats with high collars as they serve as great protectors against the wind. Whether the collar is flipped up or down, this coat is just lovely and what's also nice is that even without the belt, it still maintains a slim shape. So would you buy any of these coats? What are your go-to stores for winter coats? Don't forget to check out my guide to fall footwear too!